LASERFIT AND KERATOCONUS: How are we doing? 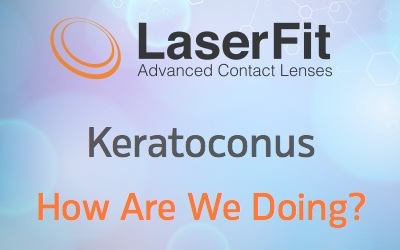 You are here: Blog / Keratoconus / LASERFIT AND KERATOCONUS: How are we doing? The Laserfit lens process with wavefront-guided optics is now in its fourth clinical year. It is the only wavefront-guided scleral lens system that is clinically available at the present time. The process is protected by 3 patents and additional patents pending. Others have or are investigating the use of wavefront-guided optics in scleral lenses for the treatment of keratoconus. In the April 2013 issue of Optometry and Vision Science, Sabesan et. al. from the University of Rochester demonstrated that the higher order aberrations of 11 eyes of 6 patients were improved to normal population levels using scleral lenses with wavefront-guided optics. Their results achieved an average of 0.37 microns of total HOA root mean square using lenses with wavefront-guided optics compared to 1.17 microns with conventional spherical equivalent optics. In the October 2014 issue of the same journal, Marsack et. al. from the University of Houston reported results on 14 eyes of 7 keratoconus subjects fitted with scleral lenses using conventional spherical equivalent optics and then with wavefront-guided optics. They reported that 11 eyes achieved levels of HOA RMS within one standard deviation of the normal population using wavefront-guided optics. Since their results were not reported in tabular format, but as bar graphs, it was necessary to make estimates of the values in order to make a comparison across groups. Using the estimated values, the Marsack group achieved an average HOA RMS of approximately 0.53 microns with conventional spherical equivalent optics compared to approximately 0.32 microns average HOA RMS with wavefront guided optics. In June of 2014 we compiled results for 9 eyes of 6 moderate to very severe keratoconus patients. Using Laserfit lenses with conventional optics, our patients achieved an average 60% reduction in HOA RMS (from 1.70 microns to 0.68 microns). With our patented wavefront-guided optics, the HOA RMS was reduced by another 48% (from 0.67 microns to 0.34 microns adjusted for pupil size). Differences in severity of the keratoconus between the different study groups probably accounts for the slight variance in results. The bottom line is that the results of Laserfit lenses with proprietary patented wavefront-guided optics are comparable to those in recently published studies by two different research institutions.